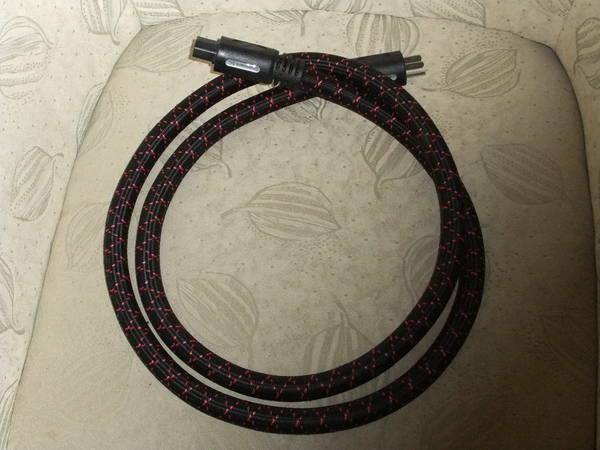 so i just recently purchased a ps audio power cord for my amp off out audiogon, for 200 bucks, from the looks of it, it looks like the ps ac10. i think i got a really good deal on the cord and i think it will impove my system greatly. now my dad thinks it was stupid to spend that much money on something like that, but i honestly think it matters. am i right or wrong please give me your opinions ? I think power cords are an improvement in most systems. My PS Audio power cord helped clean up the sound of the Cambridge Audio Int. Amp I had at the time. The power cord will last a long time so you will be able to enjoy it through the years as you upgrade components. I agree with JM. It's a long term purchase. I'm sure the list of things your pops doesn't know is long. You are defintely not alone spending $200+ on cables. Some people will spend that much on connectors alone. I personally don't wish to spend more than $100+ on any cables in my system. I, now, only buy IC when I need different length. Thick power cables on amps and preamps do improve sound over stock 18+awg cables, but I don't care to pay premium on Audio-Brand power cables. As long as cables have good connection, appropriate thickness, and offer shielding(if needed) then should be sufficient. Most of cables do sound different and/or better, you just have to deteremine whether the cost will justify your system. I HATE my PS Audio power cords. The IEC's are too small and don't fit like they should in any of my gear. Biggest waste of money. Last edited by TheHills44060; 07-18-2010 at 03:34 PM. I bought a Kimber PK10 Gold power cable from Audio Advisor (about $350) for my DVPNS999ES and I love it. You are definetly not alone..lol. The construction is quality and the connection is superior. I previously wasted money on Monster Cables Powerline series and wound up switching back to the supplied cord with the Sony. Now, I would never switch to the supplied power cord. am i right or wrong please give me your opinions ? I have found audible benefits using aftermarket power cords in my systems, but have done so largely on a refundable trial basis. Not every cord will improve every situation. The improvements are typically subtle by allowing more low level detail through with a "blacker" background. With high powered amps, they can provide some improvement in the dynamic impact department as well so long as your home wiring is larger gauge that typical (12 vs 14). Sources can most certainly benefit as well. If you are an electronics hobbyist, then you can make your own pretty darn good cables for under $100. I upgraded my basic power cords several years ago with Acoustic Zen Tsunamis and they are wonderful. The difference was immediate in 2 ways, first they provided a quieter overall presence by not allowing any type of interference through, which was already being treated by my PS Audio outlets and power conditioners, this helped take away even the slightest amount of noise. 2, they allowed my amp to get uninterrupted power that was true and steady and that helped bring the sound to life. I will say that these are not things that are noticeable in all systems and will also depend on other factors as well in the mix, but I played around with all types of cables, configurations, etc, until I found a combination that showed off the most out of the entire system on all fronts and I am still tweaking on a regular basis until I am truly satisfied. ...until I found a combination that showed off the most out of the entire system on all fronts and I am still tweaking on a regular basis until I am truly satisfied. Amen. A lot of folks really don't get it - or simply rely upon speculation to convince them otherwise. Just remember to stay open minded, and know that swapping gear won't always improve sound. As others have said, it is system and environment dependant. You might hear what you've never heard before, but might lose what you've always been able to hear. Just being curious. Are there manufacturers who optimize their gear end-to-end? From power cord to interconnects? It seems the manufacturer/engineers would have the knowledge and best opportunity to do this. Who better knows their hardware? It would save the end-user a lot of time, money and effort. It's hard to imagine a design status meeting where engineers/marketing etc. report the design is perfect, circuitry is optimized, production methods produce zero defects, advertising is hitting the correct group, but let's throw in a sub-standard power cord for economic reasons. I see the value of a quality power cable for noise rejection and power transfer from shielding and quality contacts, but I'd be more inclined to build the cable myself. I'd have the personal satisfaction, my wallet would be happier and my arse wouldn't be sore. Just being curious. Are there manufacturers who optimize their gear end-to-end? From power cord to interconnects? There are a few full line brands available. It seems the manufacturer/engineers would have the knowledge and best opportunity to do this. That would be true if there were a single answer for all systems and environments. Who better knows their hardware? Cabling choices have to do with optimizing other components in the system and the environment. They have no idea whatsoever what those may be. No need for confusion. There are too many variables for any one answer.